This Forex trading website is an informative learn Forex training course that aims to help beginner currency traders learn how to trade the online foreign exchange market. To invest in the foreign exchange market, you should first take time to educate yourself and gain knowledge of how the foreign exchange market works. Forex, Spot Forex, FX are the many names used to describe the online Foreign exchange market. Spot Metals, Commodities, Futures, Stock Indices and CFDs - Contracts for Differences being the latest addition of financial instruments being transacted alongside spot currencies. These additional instruments have also been covered within this Forex website so as to fully educate the beginner trader about all the aspects of trading the online financial markets. For example, below is a Forex trading system attached to a currency chart, this trading system is used to generate Forex signals. This is one of the basics learn Forex topics that you will learn from this online Forex training website. 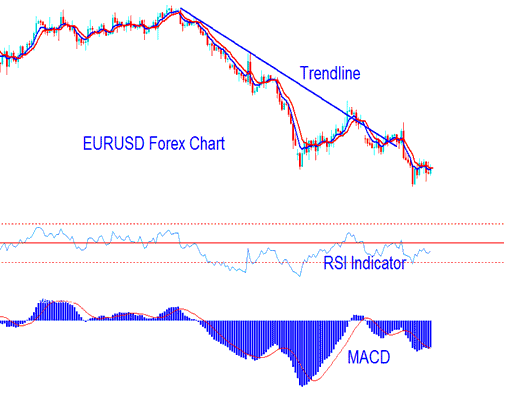 As shown on the example below, the trend line shows the general direction of the currencies, and the indicators are used to generate what is called signals. All the Lessons and concepts are accompanied by numerous snap shots that show real currency trading charts examples of the concepts explained so as to help you learn online currency trading Step By Step. This makes it easier for beginners to grasp the concepts explained with ease. The snap shots on this site that are used to explain are worth a thousand words. If you want to be trained in Forex trading the online markets, this is a good website to teach you and help you study. As an online introduction Forex training website for beginners wanting to learn Forex, this website is designed to help new beginners discover trading methods, provide Forex trading tools, Forex trading information and the required resources to those who want to gain more knowledge of how the foreign exchange market works and become skilled at it. All lessons are arranged in a systematic manner to help you easily navigate the lessons. This Forex tutorial will take anywhere between 30 and 60 days to complete, that should be good enough time to study the basics and also develop a profitable Forex strategy to use. In 30 days you should start making some profits on your demo practice account; the demo account is an account where a beginner Forex trader can practice without depositing money, on this account a trader can practice for any amount of time they want and if their strategy proves to be profitable, one can then open a live Forex account and start real trading. You may also want to open an account early as the process can take 4 weeks meanwhile you continue studying: You can also read the account opening procedure article. On this website, the training tutorials have been put together in a systematic format to explain to beginners how to start Forex trading, from the Forex basics to the more complex trading strategies used by experienced currency traders. All these lessons are combined to form a complete Forex training course that offers the fastest way to learn. These lessons will help you gain all the knowledge that you require step by step. These tutorials can be found at the main navigation bar of this web site. There is a total of about 100 free lessons on this Forex trading education website that have been divided into these three categories, starting with the FX Basics, Technical Analysis and Key Concepts. You do not need any other Forex classes or any other online Forex school - this website has compiled all the tutorials required from the beginner lessons to the advanced topics. For a beginner Forex traders asking what is the way to study Forex trading quickly - The lessons have also been divided into three sections to help you learn as fast as possible, (these tutorials are located at the main navigation menu:). These Forex basics for beginners topics cover all the FX basics, including the definition of terms, Pips, Forex spread, lots and contracts and topics about reading Forex quotes, how currencies are traded in pairs known as currency pairs, types of Forex accounts and practice demo accounts. It is good to start with these tutorials located at the main navigation menu and Our Homepage, arranged from the first lesson to the last lesson. After completing the basics tutorials, Technical analysis topics will follow, these tutorials cover a wide range of strategies, ranging from price action method, drawing of trend lines and channels, Forex charts, candlesticks charts, chart patterns, Fibonacci and divergence setups. These are some of the popular topics, used by most to analyze the price trends. Key concepts tutorial covers some of the more advanced topics, some of the favorite topics include; Forex leverage and margin, money management methods, Forex systems, generating Forex trading signals, most active hours and when not to transact currencies, US Dollar Index, online Forex brokers and psychology. Key Concepts discusses the more advanced topics used, reading and understanding these tutorials will determine if you make money or not in the currency exchange market. Topics such as Money Management and leverage margin are must learn topics for all beginners. These learn Forex for beginners tutorials have been comprehensively summarized to provide beginners with all the knowledge and skills that are required when trading in Forex currency markets online. When you want to learn how to formulate your Forex trading strategy, you need to use technical analysis, without this, you would have no foundation to define your strategy. Remember that technical analysis is a very wide topic where one is required to study many topics. 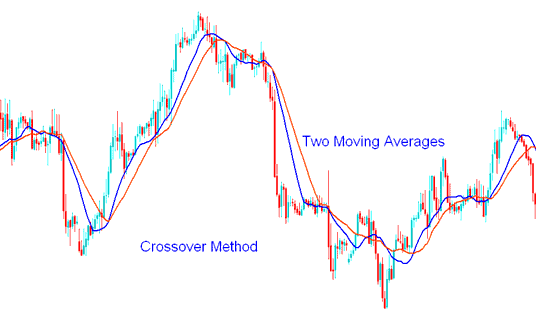 This section shows examples of simple trading strategies that can also be combined together to form other advanced Forex strategies. 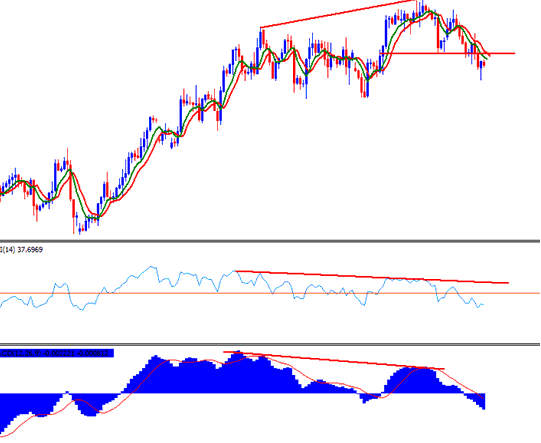 The most popular ones are discussed within the strategies section, these include RSI, Stochastic, Moving Average, MACD and Bollinger Bands indicator based strategies. All these have explained the numerous concepts used, these FX strategies are a good base from which to educate yourself and become skilled and formulate your own strategy. It is hard for Forex trading beginners to come up with their own trading systems when they don't even know what Forex is or they do not even know who is a Forex broker or what a Forex trading platform is, that is why you should start by finding out as much information so that you do not make the common mistakes made by Forex beginners. The technical analysis used in currency trading is the same as that used for Equity and Stocks. The only difference between the two is that the online foreign exchange is open 24 hours a day and Stocks market is only open for 9 hours a day. The currency trading strategies section of this website found either on the homepage or at the main navigation bar just below the site name at the top of this website. Each strategy is accompanied with numerous examples of screenshots; from price charts like the one below. These Forex strategies will not only expand your knowledge of the currency exchange market but will accelerate your learning curve. If you want to develop your own strategy that works, you need to form a basic and simple strategy and then develop it over time. Learning and improving is the key to everything in Forex. Most people start with simple FX systems and then develop them over time. Traders use these Forex indicators to form their strategy; each is different from the other. There is a total of about 100 indicators discussed within this section that can be found at the main navigation menu. 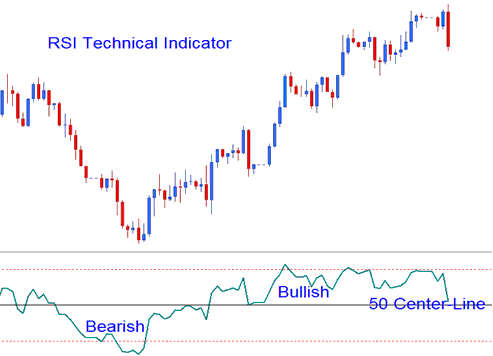 This section will cover and explain each indicator individually and show you the technical analysis that is used to generate a buy or sell signals. Currencies are transacted through online currency brokers. To start you must first of all find a good one, download their platform to transact with. From the broker you can download the software platforms and register for a free demo account. Brokers offer free trading software to login and connect to transact currencies. These software programs are known as platforms. These platforms draws and plots graphs of price movements, this graphical representation of price is known as a Forex chart and can be found on these online Forex trading platforms. MetaTrader 4 online trading platform software training tutorials can be found at the main navigation menu. Fundamental analysis is used to predict short-term as well as long-term trends. Apart from the reports that you receive from the fundamental indicators, you also need to look at the news releases and the reports coming out of important economic meetings. These reports and commentary coming out of these meetings can affect the prices and careful traders will always look for these. The above news reports are major price movers and all currency traders look at them when they are announced. That is why you must know what these reports are and when they are released by looking at an economic calendar. Most who do not know about these news reports often see major price movements without knowing where these movements come from. That is why you require a real time Economic Calendar that is updated within seconds of major fundamental reports so as to ensure that you are always ahead in your Fundamental Analysis. You can access the Economic Calendar from online news networks. You can also follow the schedule of the news reports timetable that is released well before the actual time when the news reports are announced. If you simply read these economic reports, you will get an idea about the things to come. This will help you improve your long term as well short term fundamental strategy. You will be in a better position to take advantage of these news reports. Step 4: Open a free demo practice account and start training with this practice demo using your trading system for a period of one month until you start to make Forex profits. While at the same time keep reading this Forex guide and the lessons on this Forex trading site. This tutorial will also help you improve your skills using the free practice demo account that you open with your currency broker and this way you will be practicing with virtual currency. 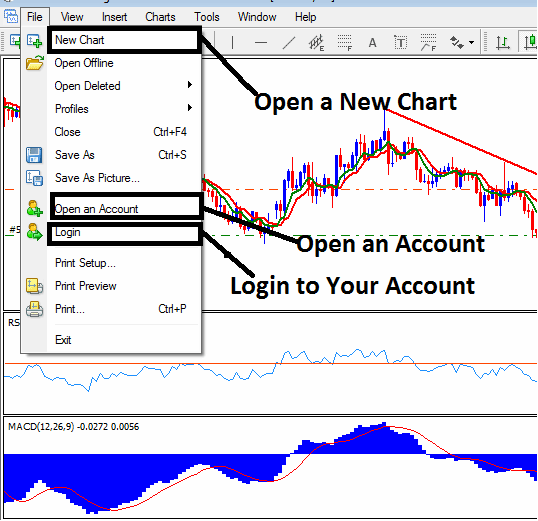 Step 5: Open a real trading account and start trading FX. To open this live trading account, a trader has to fill some forms provided by a Forex trading broker. The forms can be obtained from your broker. The step by step procedure of opening an account is explained in this article: How to Open a Forex Account.